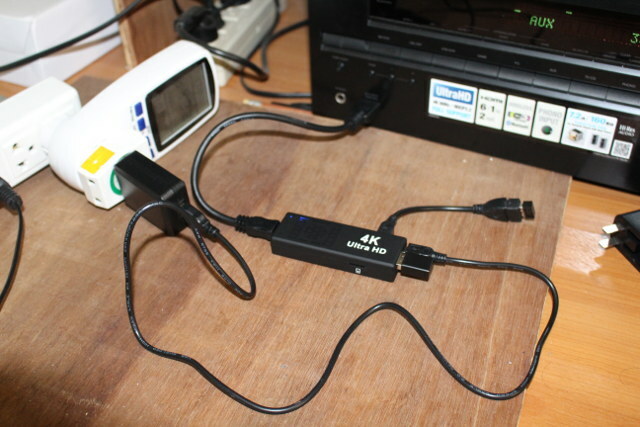 I’ve connected MINIX NEO A2 Lite air mouse RF dongle to the USB port, and Tronsmart Mars G01 wireless gamepad dongle to the mini USB port via the provided USB OTG adapter, and the provided HDMI cable to the AUX port of my AV receiver and nothing else, except the power adapter to the other mini USB port. Boot time typically takes about one minute that it’s not a speed daemon in that regards. The user interface is familiar, since it’s the same as used in Beelink MINI MX, and a few other models. The settings are also the same, so I won’t go through them all. But I could set video output to 4K @ 60Hz, and connect to WiFi (2.4 GHz only) without any problems. There’s a single storage partition with 4.41GB in total available for apps and data. 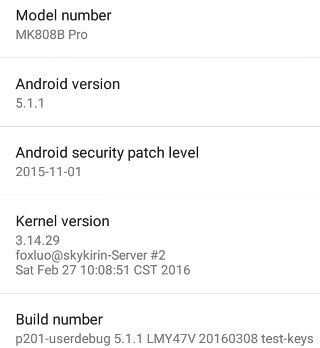 The About section reports MK808B Pro model is running Android 5.1.1 on top of Linux 3.14.29. The firmware is rooted. I also tried the Online Update in the Update&Backup app to get the latest firmware, but sadly OTA firmware update is not implemented. Since the stick does not come with the remote control, I use an air mouse, but in theory if you don’t have one, you should be able to use RemoteIME app after enabling “Remote” in the “Remote & Accessories” settings. This did not work for me the first time with the app unable to find MK808B Pro, but as I tried again a few hours later, it worked pretty well with keyboard, mouse, and remote control modes. The lack of remote also raise a problem when you want to turn off the device, especially since there’s no power icon on the task bar. I could turn off the device by connecting a USB keyboard, and pressing the Power key. It works, and power consumption in that mode is only 0.3 Watt. However, the only way to turn the stick back on is to manually power cycle it, by disconnecting the power supply for a few seconds, and putting it back in. So it’s definitely not user-friendly. I could install most apps needed for review the first time I used Google Play, except most games would not be compatible with my device. I tried again later, and i could install Candy Crush Saga, and Beach Buggy Racing. So Google Play is working OK. Amazon Underground refused to install though. After 5 or so minutes trying to install the apk, it will just say “App not installed”. I downloaded it twice, and tried to install it a few minutes with the same result. MK808B Pro feels a little sluggish compared to other device, and you may have to be especially patient when installing apps. Sometimes apps exit by themselves, while other times, I would only get a black screen with the status bar when trying to get back to the home screen. I wonder if it would be because memory is tight. So my first impressions were not that good about the device. 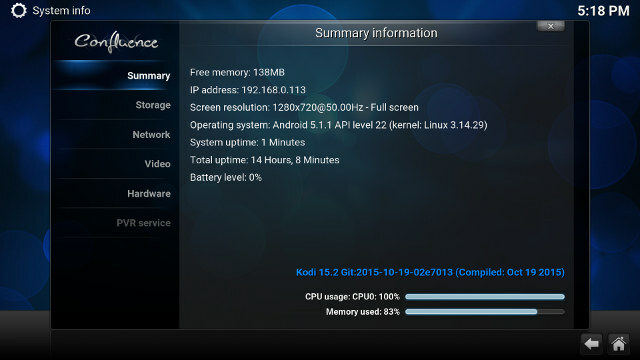 Then I switched to the pre-installed Kodi 15.2 which comes with some add-ons. For some weird reasons, Kodi 15.2 reports a 1280×720 screen resolution, but if you enlarge the screenshot below, it is instead 1920×1080. big_buck_bunny_4k_H264_30fps.mp4 (4K H.264, ~ 8 Mbps) – Choppy as hell, frequent audio cuts, artifacts may appear after a while. big_buck_bunny_4k_H264_30fps.mp4 (4K H.264, ~ 8 Mbps) – Video somewhat smooth at the beginning, but then becomes more choppy with frequent audio cuts. Kodi decided by itself it could not take it anymore, and exited by itself. Fifa_WorldCup2014_Uruguay-Colombia_4K-x265.mp4 (H.265 @ 60 fps – ~6.5 Mbps) – Video not smooth, and some audio cuts, but no buffering issues here. After a few minutes, Kodi exited. If I wanted to access Kodi UI while the video is playing, key inputs from my air mouse were either irresponsive, or with 10 seconds or so delay. 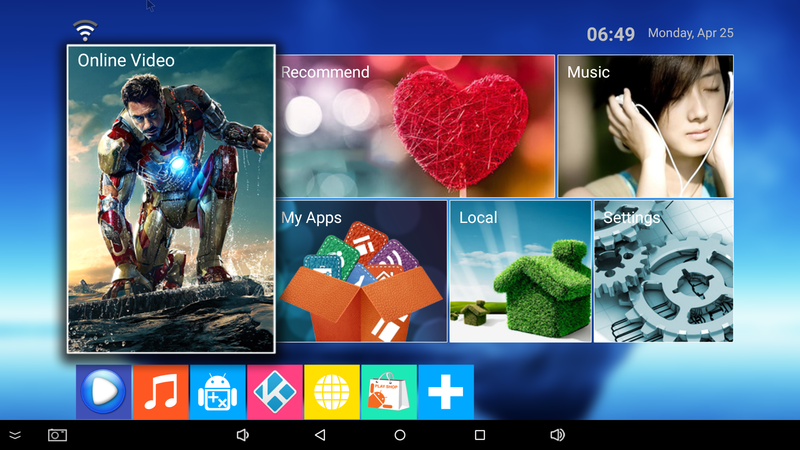 I’ve decided to to waste any more with Kodi, and video playback, on that TV stick. WiFi throughput averaged about 2.6 MB/s after several transfers between the internal flash and a SAMBA server. Not a catastrophe, but still below average. I also tested the internal storage performance with A1 SD bench app, and the results clearly show why the stick is so cheap. I’ve only played Beach Buggy Racing game on MK808K Pro. 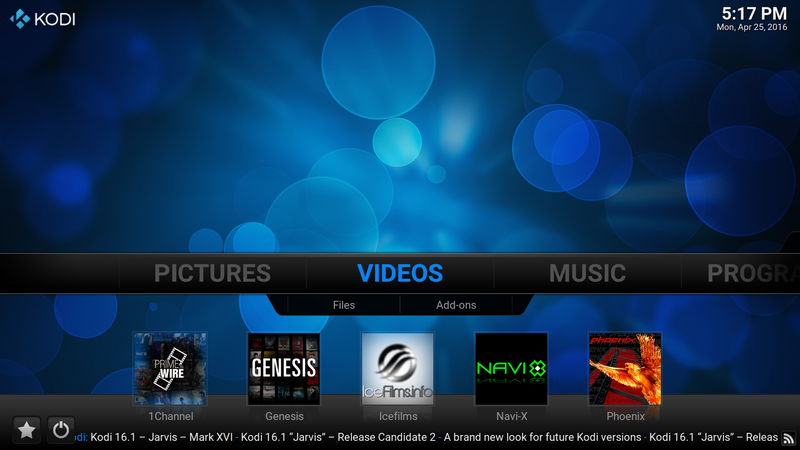 At the beginning it was not quite as smooth as on some other Amlogic S905 based TV boxes, but still playable. However, the games became very slow near the end of my first races (one lap – less than 1 minute play), and stayed that way after that. I measured the temperature on the top and bottom of the device, and both were around 60 C. I’ve also notice that at the beginning my power meter reported 4.4 Watts, but when it became slow, it dropped to 3.0 Watts, most probably because the system was throttling. So the lack of heatsink, possibly combined with high ambient temperature (30 C), is really a problem with the stick, and you can’t expect good performance over time. I’ve finally ran CPU-Z and Antutu 6.1.4 to complete the review. The package mentions the CPU was clocked @ 1.5 GHz, but CPU-Z and Antutu info both reports a Quad coe Cortex A53 processor clocked between 100 MHz and 2.02 GHz. 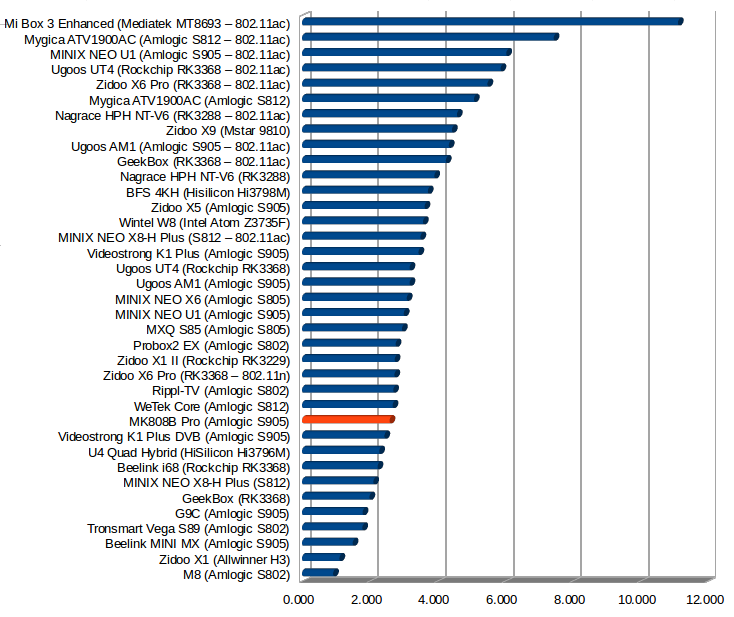 But whenever it reaches 2.02 GHz, it won’t stay there for long, as we’ve seen before. The total RAM is only 775 MB, with 4.41 GB internal storage. MK808N Pro is also based on p201 board. Antutu 6.1.4 score is 31,5166, but that’s without 3D graphics. I tried to run the benchmark again, but it would always get stuck during “Image Processing Fisheye” test right after the 3D benchmark successfully completed. It was a complete system freeze, I noticed the power draw was 8.4 watts, and my IR thermometer reported 88 C. I had to turn if off, and let it cool for 5 minutes to be able to use the stick again. I wonder why anybody would buy MK808B Pro, even if the price is so low, as I’ve had so many problems, it performs slowly, Kodi 15.2 & Kodi 16.1 don’t handle 4K video very well at all, and WiFi performance is under par, at least with my setup. Maybe the stick works better at a lower ambient temperature, but I would not bet on it. GeekBuying kindly provided the sample for review, and if for some reasons you feel the urge to buy it, you can do so for $34.99 including shipping. Thank you for review. It’s sad that new s905 can not perform well in this PC stick form factor. If they had put a heatsink, and maybe limited the frequency to 1.5 GHz, it might have been a better device. So it’s still possible somebody comes up with a better S905 TV stick. Thank you for another recommend review. This MK808B Pro now seems not worth to buy. If no support from any developers this it is useless. Better invest to brand that has support like Nvidia TV much more worth money. Hi guys, I’m looking for a recovery.img file for TWRP for this device, the MK808b Pro S905. I don’t want to install TWRP just load the recovery.img file from an SD card. I’ve tried a few .img files but none of them work, they device just goes into the stock recovery. Anyone got any ideas? Thanks in advance. It seems to put more power into it. Are there any android tv boxes that work that come in the stick form factor? Or is the heat dissipation always going to be an issue? 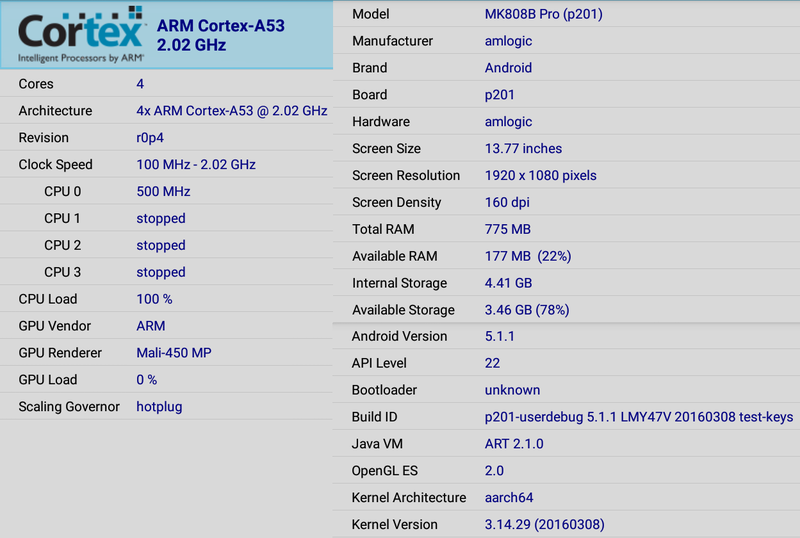 M85 Android 4.4 Amlogic S805? 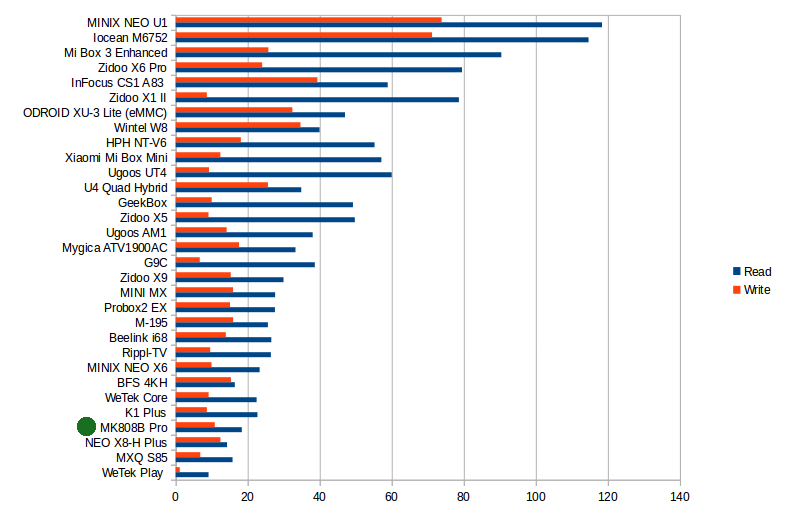 MK808B Plus based on Amlogic S805 had pretty good reviews at the time.